Following the teaser film presented yesterday evening, Italiaspeed unveil the next film sequence which builds up to Fenomenon Holistic Design's amazing Stratos launch on Tuesday, 1 March at 08:30 CET. Legendary Lancia Stratos rally driver Sandro Munari will take the covers off the apple green Stratos prototype, which itself is a production-realistic proposal. 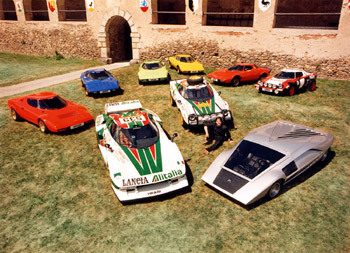 We would like to emphasize that the 2005 Stratos project has had no involvement from Lancia or Fiat whatsoever. In fact, until yesterday, no-one at Fiat has had the chance to learn anything about this fascinating project, a project that started three years ago. Instead, the concept car is the realization of one man's life-long ambition, and that particular man is London-based Christian Hrabalek. 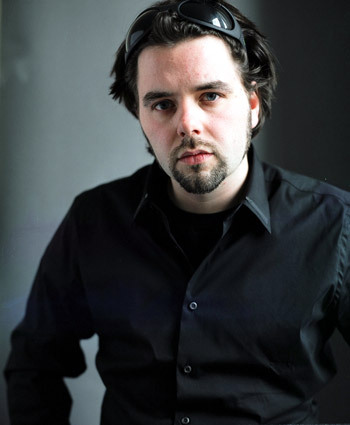 ‘Hrabi', as he is known in the design industry, is the world's leading Stratos collector. At the age of 27 he possesses no fewer than nine Stratos cars, along with a wealth of Stratos-related memorabilia. 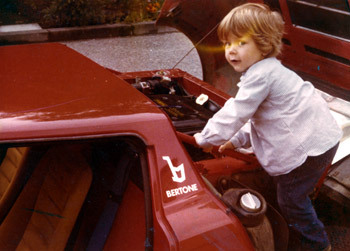 Above: Christian Hrabalek at the age of three in 1980 with the first Stratos from the Hrabalek collection. Middle: Christian Hrabalek is surrounded by his Stratos collection in the summer of 2000 (the Zero is not part of the collection, whilst a ninth car was undergoing restoration at the time). Below: design and management consultant 'Hrabi' in 2005, is enthusiastic as ever about the Lancia Stratos and is looking forward to the launch of his new Stratos concept car at Geneva just under two days time. Above: the sequel to Part 1, this exclusive virtual animation shows the fantastic 2005 Stratos concept from Fenomenon Holistic Design, London. Born in 1977, Hrabalek bought his first Stratos model at the age of three. Due to his family's Stratos collection, which started in 1980 after the sale of many previous exotic cars, Hrabalek “grew up with Stratos”, with his father's collection being handed down to him after graduation from university. The cars owned in the Hrabalek collection include the original fluorescent red prototype that appeared at the 1971 Turin Motor Show. This was exactly one year after the presentation of the Bertone Stratos Zero concept, a design touted by the Piedmontese firm as their most striking shape of the ‘70s. The 1971 prototype was a real one-off, as most of the components were unique from the production cars that followed. The alloy wheels themselves were designed specifically by Bertone designer Marcello Gandini, whilst the double wishbone rear suspension was lowered as the initial prototype was not intended for rallying use. Even the styling was slightly different to the final production car, with the front being slightly sharper in form. Initially, this show prototype (chassis number 1240) was painted in white and had no engine. It then received a Fulvia unit and then a Beta engine resulting in the chassis number being changed to 1240B. The engine was then replaced with a Dino 206 V6 and the chassis was renumbered 1240C, the car being subsequently repainted in fluorescent red. However, this colour scheme was to be short-lived, as the car received Lancia's Marlboro sponsorship colours when it resided in the Museo Lancia in 1974. Museo Lancia sold the car in 1979 due to lack of space, and it has since received the fluorescent red paint that chassis number 1240C rightly deserves. This particular car from the Hrabalek collection will be presented alongside the 2005 Stratos concept on the stunning Fenomenon stand this Tuesday. Other cars in the Hrabalek collection include an early production example in blue (hence without a rear spoiler), a green road car and a yellow road car (both with low odometer readings), a highly original red road car (the first in the Hrabalek collection), a Group 4 rally car in (non-original) Pirelli works colours, an East African Safari car in Alitalia colours dating from 1977, the 560 bhp KKK turbocharged rally car with Kugelfischer indirect injection from 1976 (brought back to Europe by Hrabalek after it had spent 23 years in the East), and finally a rallycross car that has been restored. The Hrabi collection also includes the original wooden buck which Bertone used to form the panels for the production cars. This particular buck was also used by Lancia for presentation purposes, with a windscreen and wheels fitted for certain occasions to make it appear like a real car. The focus now lies on the next generation Stratos, with the concept to be presented at the Geneva Salon within two days. Italiaspeed will show a full-length, in-depth development report at 0600 Tuesday 1st March. Until then we have disclosed this exclusive sequel to the trailer presented yesterday evening.